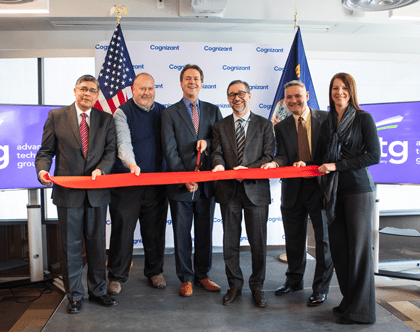 TEANECK, N.J., March 13, 2019 /PRNewswire/ — Cognizant (Nasdaq: CTSH) today announced the official opening of its Cognizant ATG Missoula Solution Center in Missoula, Mont., which follows Cognizant’s 2018 acquisition of Advanced Technology Group (ATG), a provider of customer and revenue management consulting and implementation services focused on the Salesforce platform. The event at the Cognizant ATG facility, located at 945 Wyoming Street in Missoula’s Old Sawmill District, featured speakers and guests including: Montana Governor Steve Bullock; Missoula Mayor John Engen; University of Montana President Seth Bodnar; Cognizant Executive Vice President and President, Global Delivery, Debashis Chatterjee; Cognizant Executive Vice President, North American Digital Hubs, Allen Shaheen; and ATG Senior Vice President, Strategy and Corporate Development, Tom Stergios, who serves as the new center’s site leader. State and local officials, members of the academic community, Cognizant clients, partners and other special guests participated in a ribbon-cutting ceremony and tours of the facility. Cognizant ATG helps businesses of all sizes more effectively plan, implement and optimize cloud-based business processes and technologies, with clients in a wide range of industries, including financial services, healthcare, communications and technology. Following completion of the acquisition in late 2018, ATG became part of Cognizant’s Enterprise Application Services practice, which has one of the largest number of Salesforce-trained experts in the world. The new 15,700 square-foot Cognizant ATG Missoula Solution Center is currently staffed by approximately 90 employees. Cognizant has approximately 175 employees throughout the state. ATG will also continue to operate in its office in downtown Missoula for the next two years, with plans to consolidate and expand all operations and staff within the Old Sawmill District. Cognizant today also formally announced a new training program in partnership with the University of Montana at the Missoula College campus. The 12-week program focuses on preparing students for technology consulting roles by offering specialized business and technical courses, including systems analysis and design, data analytics, project management, information infrastructures, and Salesforce cloud platforms and technologies. Students successfully completing the program will have the opportunity to apply for open positions at the Cognizant ATG Missoula Solution Center. In addition, Cognizant presented a $25,000 grant to the University of Montana’s SpectrUM program, designed to inspire young Montanans to pursue higher education and possible careers in science, technology, engineering, and mathematics (STEM). The program serves more than 200,000 children annually, and has been at the center of ATG’s philanthropy mission in Missoula since 2014.